alaTest has collected and analyzed 28 reviews of Corsair Strafe Mechanical Gaming. The average rating for this product is 4.8/5, compared to an average rating of 4.2/5 for other products in the same category for all reviews. Reviewers are impressed by the reliability and durability. The design and usability are also appreciated, but there are some mixed opinions about the size. We analyzed user and expert ratings, product age and more factors. Compared to other products in the same category the Corsair Strafe Mechanical Gaming is awarded an overall alaScore™ of 93/100 = Excellent quality. Though it may lack a few of the high-end extras offered by more expensive models, the Corsair Strafe Mechnical Gaming Keyboard is well made, customizable, and affordable. Reasonable price. Mechanical keyboard with per-key backlighting. Customizable visual effects. Full individual-key and macro programming. USB pass-through. Red backlighting only. No wrist rest. 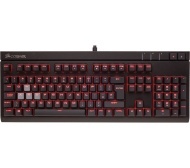 The Corsair STRAFE currently retails for $109.99 with Cherry MX Red switches, with the brown switch keyboard set to release shortly. My gamer son bought it, very happy. Same Cherry MX keys as other more expensive options, good brand, nice build quality. Very nicely designed and sleek looking. Exchangeable keys are big bonuses. Excellent keyboard. Moulded keys are comfortable, perfect for gaming or typing really loudly! Didn't come with the little wrist support fairing at the bottom. Not advertised as such, I just wanted one.